I’m meeting a big milestone tomorrow. One year ago tomorrow, I had my RPAO. At the bottom of this post there is a new photo of my scar. It’s getting better, but the redness at the top still bothers me. A lot has happened in the last 365 days (actually 366…this year is a leap year). Honestly it’s been the most difficult year of my existence. It is reassuring to think where I was then, newly cut open and broken, and see where I am now. I am doing well. I have healed well. My recovery went well. Friends like to mention that and it’s all true. But I am not perfect. My hip is not 100% and that’s frustrating to me. For a long time I constantly felt fragile and weak and unable. Now I have moments when I feel strong, usually after I’ve completed some physical task, but I pay the price later with soreness. I do still feel fragile sometimes and I hate that feeling. I’m one year post-op for my right hip and just under 5 weeks pre-op for my left hip. I’m starting to make lists of what I need to accomplish before surgery. Most of it is spring cleaning of my house and spring clean-up of my yard. I will need to prepare and freeze some dinners eventually. I’ll also need to dust off all the “old lady” equipment (crutches, shower seat, toilet raiser) and put it all back together. I don’t really want to have that stuff sitting around just yet. I’m having a hard time staying positive this time. In most ways, it’s so much better to have been through it already. Knowledge and actual experience trumps reading anyone else’s story. But, having that knowledge taints anything I try to enjoy now. Steve and I talked about taking a trip at the end of this month to San Diego and Palm Springs but we’ve decided not to do it because I don’t think I’d be able to enjoy myself with surgery on my mind. Physically I could walk around, sight-see, swim, maybe learn to surf, but mentally I would have a cloud following me around. I feel like those commercials for depression medication where there’s an actual cloud hovering over the depressed person. 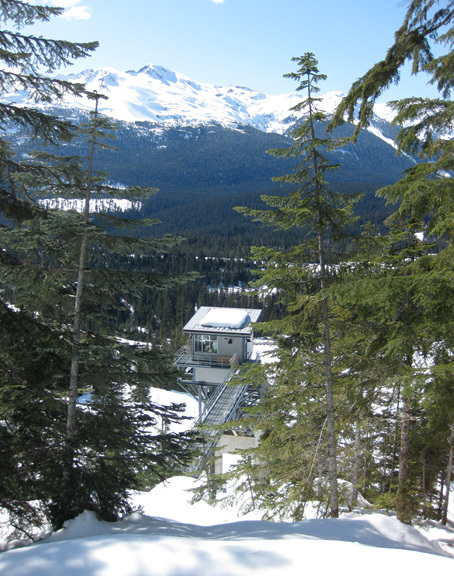 Last weekend Steve had a Thursday meeting with his client in Whistler and we made a long weekend out of it. 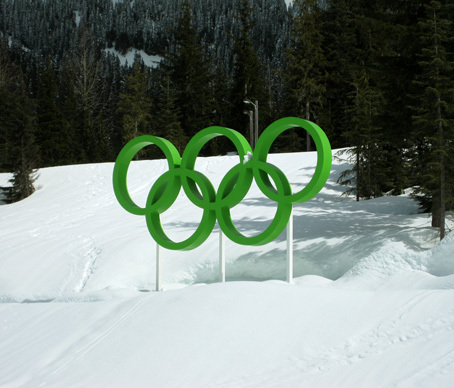 On Friday we drove to the Olympic Village, where they did the ski jump, cross country, biathlon, bobsled, etc., and did some cross country skiing. On Saturday we were both sore from skiing and decided to take it easy and “just” snowshoe. What we didn’t realize until too late was that we had ended up on a black diamond trail. We started at the bottom of the ski jump and climbed up above the top of the ski jump. As we were climbing I remember saying to Steve, “there better be a big payoff at the top.” There was! Sunday we walked around Whistler Village looking in some shops. I didn’t last very long. Two days in a row of non-typical activities had left me pretty sore. I’ve been getting a pinching and tightness at the bottom of my incision in my groin and across the front of my hip. I just e-mailed Dr. Mayo’s office about it today. I was pretty disappointed that milling around town did me in. It was a fun weekend but I came home a little deflated. Your scar looks great! Your state-of-mind is to be expected, still I’m sorry to hear it. I hear you on the “hardest year of your existence”. I haven’t even had any surgery and it’s been the worst 8 months of my life. Today we went to see CATS at the Paramount. In addition to my hip pain, I had to watch all these dancers do amazing things with their bodies and it was so depressing. there is so much more to hip surgery than i would ever imagine. thank you for sharing and being honest—otherwise i would think it was a breeze because you make it look relatively easy. i wish there was something i could do to make you not dread the surgery/recovery. i don’t know much about hip surgery, but i hope that it will all be worth it and you will end up in a much better position for persevering through this. i’m keeping you in my thoughts and look forward to seeing you on friday! Kara, there is a lot to it. What I’m doing is not like having a replacement, which is what most people know about. I’ve been relatively complication free too. Others have had it much worse than me, so I am thankful for how well I have done. I really do appreciate you reading my story. I hope it’s all worth it in the end too. Time will tell. See you on Friday! It’s very reassuring and honestly gives me a feeling of not being so alone when I stumble upon people that I’ve had the same surgery as and have had some of the same feelings as. Your scar looks amazing and I hope your second surgery goes smoothly! Thank you, Emily. These blog posts are quite old at this point. I am now 5 1/2 years out from my second PAO. Everything went well and after another long recovery, I have moved on with life. My hips aren’t perfect, but they are greatly improved since the surgeries.